It's tough being a sailor in Chicago. Not only are we chided for being "pond sailors" (which could not be further from the truth!) but our sailing season is short and our winters are LOOOONG. But we're a tough bunch. Some of us (not I) even "frostbite" - dinghy sailing in the bone chilling couple months that buffer both ends of the sailing season (October and April, respectively). Personally, I like to go skiing in that in-between time. There IS, however, one event that all Chicago sailors look forward to. It is the proverbial "bone" thrown to us seasonally-forced landlubbers in the dead of winter to remind us that - yes! - there is a summer! And it will be here before we know it! So lets start thinking about our boats! This event is... Strictly Sail...and it is *AWESOME*. Not only is it an event to socialize with our long lost sailing friends who we haven't seen in months - but it is a fantastic way to meet and hear the experts you read about in magazines and books and the best place to touch and feel ALL the gear and hardware that you've been researching or seen glossy pictures of. Kid in a candy store style. A really, really, REALLY big candy store. Scott and I went last year and had the best time. It was the first time that both of us took advantage of the wonderful seminars the show offers and we learned a TON and had a great time doing it. We literally filled our show calendar with seminar after seminar from 9-5 like eager college kids, soaking up all that nautical goodness like sponges. 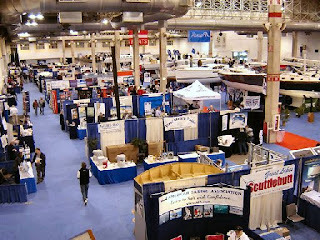 If you are heading to the show and haven't attended any seminars in the past - you should. They are super duper. This year, unfortunately, our show is being cut short due to the unforseen move we have to make this weekend so we will only have one day to attend. This is really unfortunate because now that we are actually boat OWNERS and not just sail-show groupies we actually have a ton of work to do at the show (namely: meet with engine guy, talk to Monitor windvanes; research windlasses, winches and hoses and figure out how to re-configure our boom vang - to name a few). BUT.... what we are MOST excited for this year is to meet John Kretschmer - who's book, "Flirting with Mermaids", I am reading right now (buy it!). Scott's very good friend, Shawn, was talking about us and our upcoming adventure to one of his clients who immediately said, "They should talk to my brother John!!". When Shawn, who is not a sailor, was telling Scott about this guy "John" on the phone Scott just happened to glance down at the coffee table and see his book, "Do you mean John Kretschmer?" he asked...and voila! We emailed John and despite being very busy with the show and all, he is very excited for us and has agreed to a beer!! A BEER! For us, this is kind of like a 13 year old getting to meet Miley Cyrus. He is *that* cool. He's been there, done that, AND bought the t-shirt. So, while I am no longer going to be a part of the show as a rum & coke slinging "Harken Girl" (as I was in the pic circa 2007) I have grown up and out of my rash guard and am now a boat owner looking much further on the horizon (and much deeper into my pocket)!